I am so excited to share this post with all of you! As many of you may know, I have been suffering with horrible acne scarring and pigmentation over the last two years and, as a result, have tried many different products promising to diminish all the marks and leave me with supermodel skin – but to no avail. 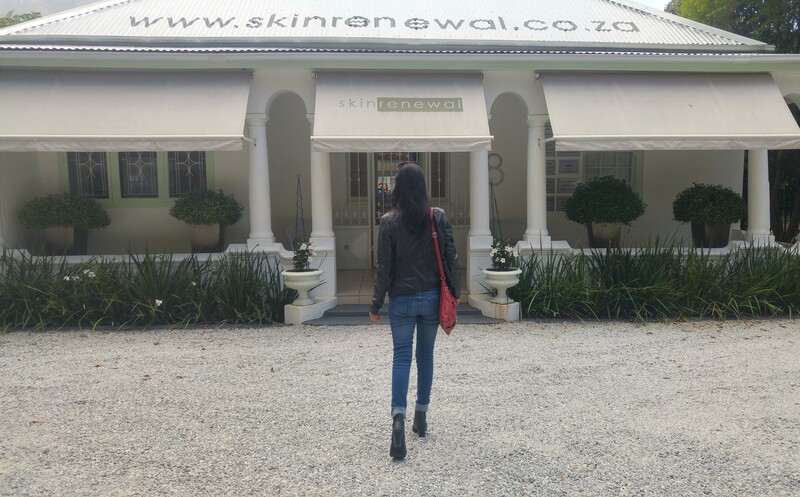 Recently however, I met with the lovely Dr Toni at the prestigious Skin Renewal in Claremont and am so excited to be starting my journey to clear skin with this wonderful brand. Skin Renewal is one of the biggest Medical Skin Care Aesthetic Clinics in South Africa and boasts about 16 excellently managed branches which all specialise in a full range of aesthetic treatments that will help you achieve the skin you dream of (and for me, that’s an absolutely flawless face!). My first consultation was with Dr Toni at the Claremont branch where she assessed my skin while I chatted about my skin history and needs. She then recommended a few treatments ranging from peels to Dermapen which combined, would help me achieve the acne scarred free skin I wanted. After about 2 weeks of my initial consultation, I booked an appointment for the first of my treatments with my lovely therapist, Maricia De Klerk who has been working at the clinic for about 7 years. As per the recommendation of Dr Toni, Maricia started me off with an Azelan Peel which is a quick, superficial peel that contains salicylic and azelaic acid to help lift dead skin cells while stimulating the metabolism of the cells underneath. I will be sharing my journey with you all on the blog over the next 12 or so weeks and, if I am not too shy, might even share my before pictures! I definitley agree! A consult with one of the doctors will be really great as they are so helpful! Hi how has it been going? Want to try this if it works for you. My skin was quite lovely after the above mentioned peel. I noticed a very little flaking and a definite reduction in breakouts. I had my dermapen treatment on Monday and it went very well. I would highly recommend the dermapen for any scarring as it is just wonderful in breaking down pigmentation and increasing cell renewal and collagen in the skin. I would however suggest that you make an appointment to see the doctor and chat about your concerns and needs. I still have about 4 or 5 more treatments to go for but I am quite happy so far!